I am excited to offer you this preview of the 2017 Studio Editions. 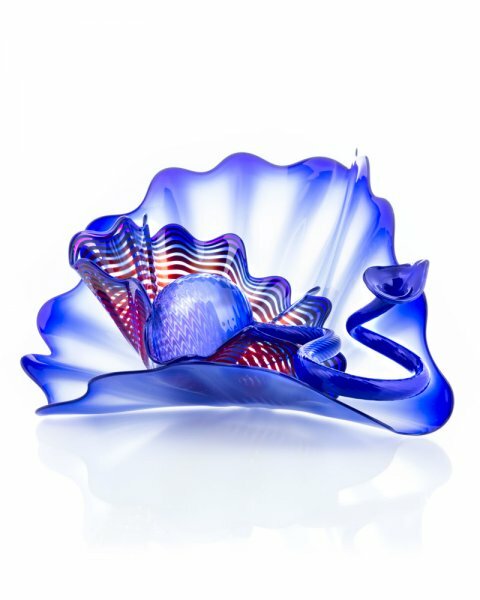 Each year I feel that the new offerings of these gem-like smaller versions of Chihuly’s signature series have outdone those from previous years. This year’s Studio Editions are no exception. Please call or email me for further information. Rose Blush Macchia by Dale Chihuly, approx. 6" x 9" x 9"
Rose Blush Macchia, a 2017 Studio Edition, illustrates the mastery of color that is the result of Chihuly’s extensive color studies. The sculpture’s vitality emerges from the brilliant, variegated spots of orange and red pigments. These pigments, stretched and transformed in the process by breath, heat, and gravity, are illuminated against shadowy bands of rose and violet hues. A radiant yellow lip wrap emphasizes the classic rippling form of the Macchia series and bridges the colloquy between the exterior color and the soft blue interior. The result is incredibly earthy yet surreal. Atlantis Persian by Dale Chihuly, approx. 8" x 10" x 10"
The 2017 Atlantis Persian Studio Edition is a full expression of this series that began in 1986 and has continued with compelling vibrancy as can be seen immediately in this piece. The entire form is wrapped in brilliant shades of green and transparent blue. These exquisite lines, called a body wrap, radiate from its epicenter before rippling and folding in upon themselves. A royal blue lip wrap applied to the composition’s outer edge articulates its gentle, undulating energy. 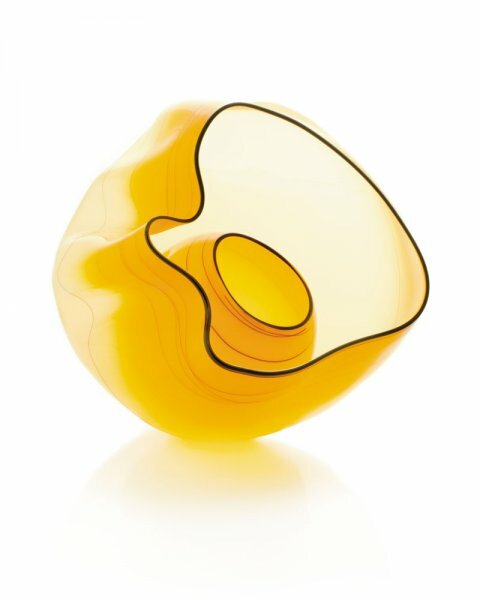 The soft, cool bending of color and light creates a luminous quiet – a tranquil fluidity forged in glass. Golden Topaz Basket by Dale Chihuly, approx. 8" x 7" x 9"
The 2017 Chihuly Workshop Studio Edition Golden Topaz Basket, presents a true depiction of the artist’s original vision. Two honey-gold vessels constitute this intimate sculpture. Wrapping around both elements, a thin, dexterous ribbon of deep oxblood red, which occasionally strikes black in the annealing process, further defines the asymmetrical Basket forms. The smaller element nestles within the larger creating a diaphanous and weightless introspective environment. Byzantine Blue Persian by Dale Chihuly, approx. 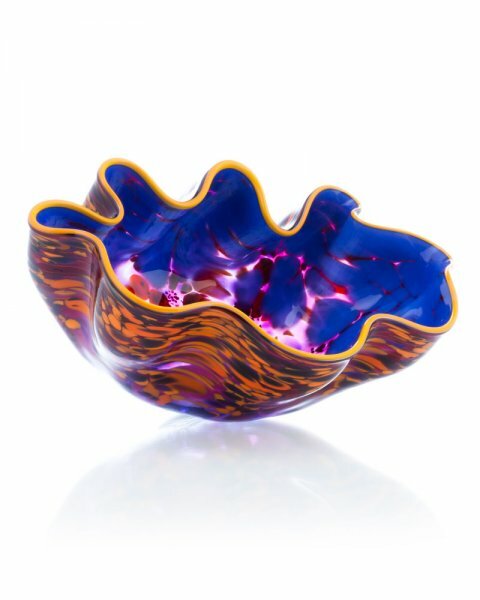 7" x 10" x 10"
Dale Chihuly’s Persian series originated in 1986 as a search for new forms. 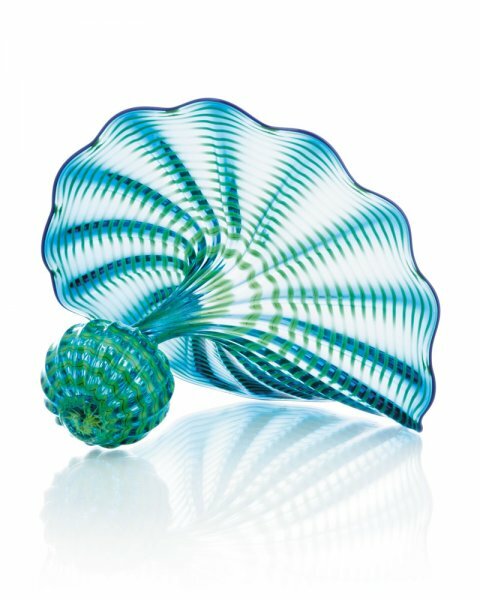 Byzantine Blue Persian, a 2017 Studio Edition, is the first Chihuly Workshop Persian edition composed of three individual elements. The largest one, sheer pearly-blue at its center, fans and opens out to a deeper blue rim conveying its swaying spines and graceful movement. Within it rests a dazzlingly red-striped form that provides an inviting and contrasting dimension. The composition’s final element, a rich blue, expressive, and gently coiled serpentine form, reiterates the poetic suppleness of the sculpture in its entirety.